Aaron is going to be 3 years old on Saturday and we haven't had a date night since he was born. So this Saturday I was determined to get a movie, some chocolate (dairy milk preferably - hate dark) and get Aaron to bed at a reasonable time for once (believing it to be possible having got him down early Friday night for the first time in months). "WHAT? We have a date night once a week/month! Just do it!" "WHAT? Our children are 3, 5, 7 and 9 and we've NEVER had one! Lucky you!" Either way, we NEED ONE! So on Saturday, after Aaron and I had a superb day in the park, we went shopping on the way home. Tesco is near the park, so it should not have been that big a deal, but I did not bargain on them not stocking Aaron's milk: Cow and Gate Infasoy. We've always bought it in Tesco and Boots for 3 years, but apparently this branch was not big enough to stock it. What didn't help, is for the first time since he was born, I'd let it run out, so getting it another day was not an option. 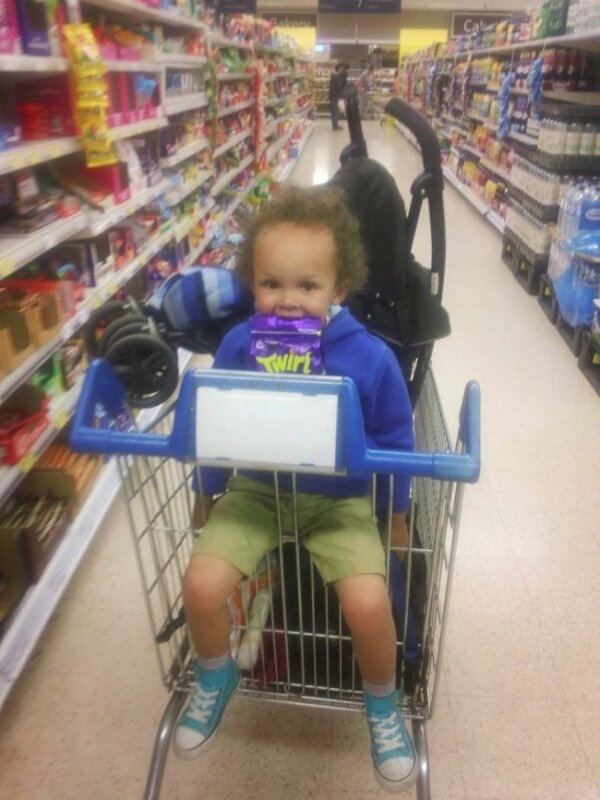 As you can see we had a lot to choose from - Aaron's wondering why Mummy's trying to get just the right photo :-) The Cadbury's Bite Size range is quite prominent and there are quite a few withing that range itself to be spoilt for choice. They really are bite size too and as such quite moreish! I don't allow Aaron to eat a lot of chocolate, but I don't 100% ban it either, so it was mainly for Mummy and Daddy but just for fun I asked him which one he would pick. I wasn't surprised with his choice of Twirl given that he's had quite a few ice cream cones lately and the Twirl so closely resembles a FLAKE; well it does to me anyway. Taking a bite in the only way he can considering we are yet to pay! LOL! This next one was meant to make three so that technically we'd have one each, but this turned out to be the one that got away, which you can find out more about in our Google Plus album that tells the full story of this blog post. So I bought two movies in Morrisons, the supermarket we went to next, in order to get Aaron's milk which Tesco (that branch of it) didn't stock. It was a 20 minute walk to Morrisons, but I wasn't going to bus it as I only had enough on my Oyster card for the one journey home and wasn't expecting to have to go to two supermarkets. As it turned out the walk was pleasurable - it was a lovely evening as my Google+ album shows and we enjoyed the walk. Aaron stayed in the buggy so I was able to walk at a very brisk pace. Means I got some exercise in too = result! So here below are the two bargain movies I got *coughs* along with a load of other snips/offers I simply could not resist. 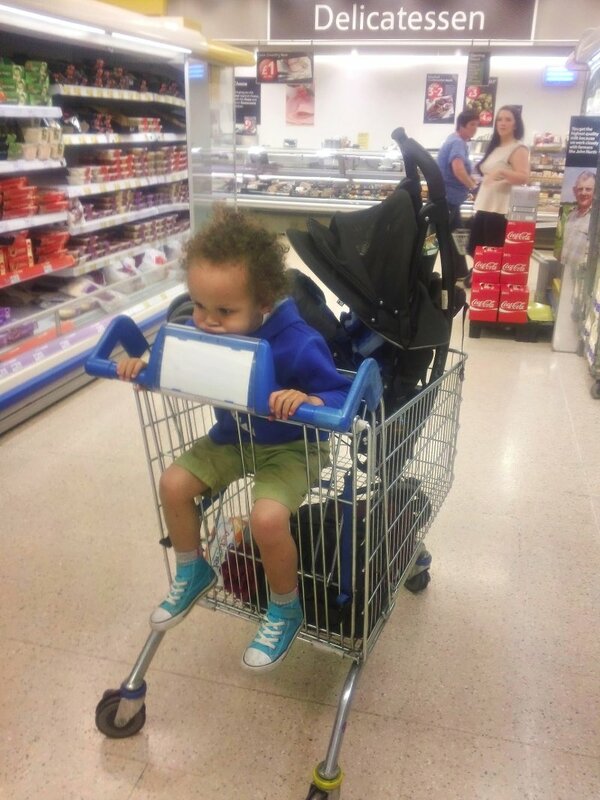 The buggy was laden down. Turns out I should have listened to my inner whisperer. 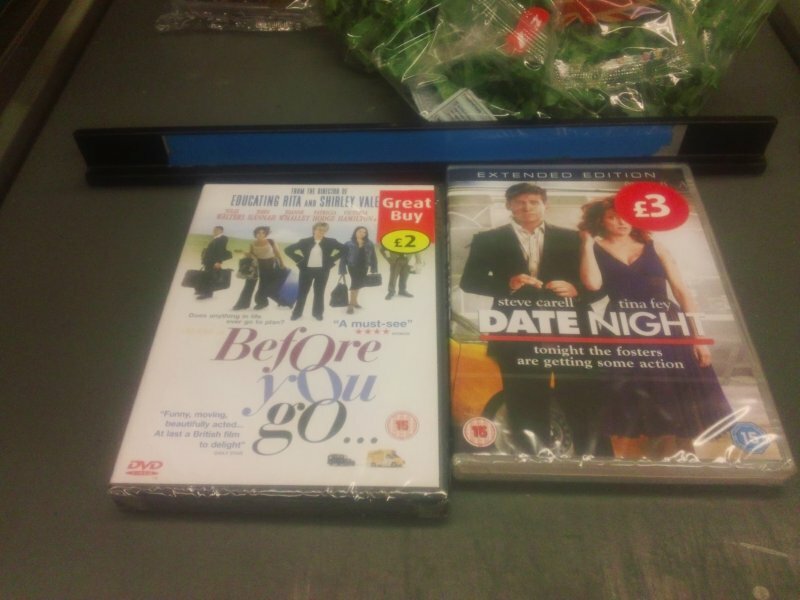 Something told me I recognised the cover of Date Night, but because it was the same name as I was hoping to have that night, I could not resist it. The hubby burst my bubble when I was happily unpacking the shopping, to tell me we already own it. When asked if I've watched it, he says "no!" When asked why he would watch such a movie alone, he reminds me that we haven't really watched movies together since Aaron came along, and that the Bridesmaids that I had recently watched AND enjoyed, it had taken him MONTHS to get me to watch. Oooooops. So I give myself an internal high five that I got TWO film options and take the below photo. I'm not really a huge fan of the bath, bottle bed model, but decided to follow it Saturday night as it had worked a treat on Friday. So I got Aaron into the bath at a reasonable time despite the evening trips to TWO supermarkets, then gave him dinner, and a bottle and bed was therefore a breeze. He was asleep by 21:20 for the second night in a row - it's been way later lately. So I get myself into the sitting room, all expectant for the date night / movie night. I dig into the popcorn chocolate knowing it is right up the hubby's street, and he says he is too full from dinner. THEN he decides that what is on the telly is good. A movie called The Ghost Writer. I patiently sit there playing with my computer (which is not working) for hours, waiting for it to finish and when it does, the next movie on is The Others, so my DVD is being neglected. Hopefully a Date Night - either movie or otherwise will be coming to a cinema sitting room near me soon. 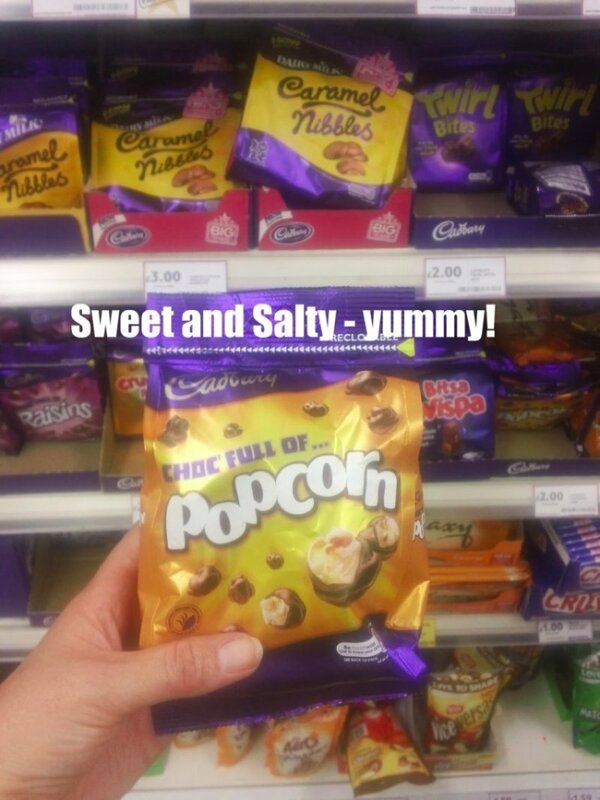 Click here see the full Cadbury range. 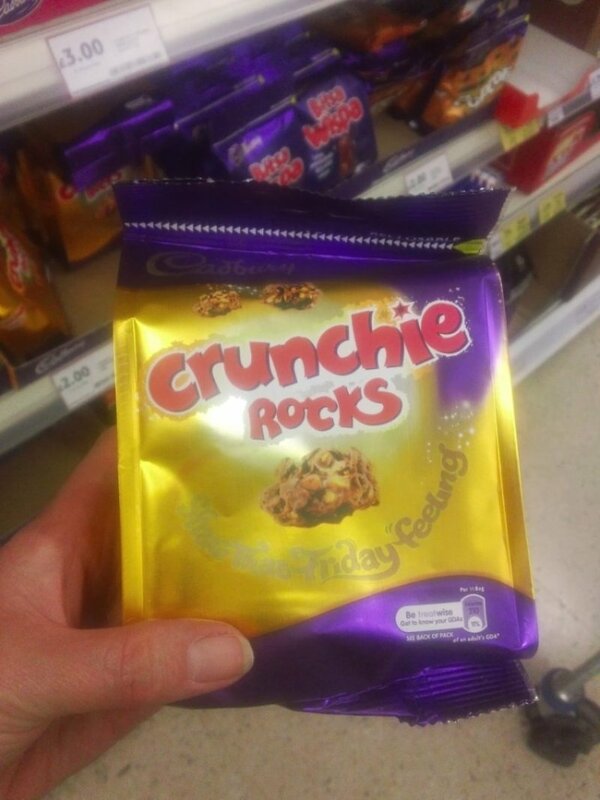 Oh it has to be said though, that MY favourite Cadbury product at the moment is Marvellous Creations (jelly popping candy shells covered in delicious Cadbury Dairy Milk) ... Have you tried it? I have a bar next to me right now. In fact it has provided me my sugar boost all the way through this blog post. Even though the popcorn one was my favourite, it is a couple of days later and I am still munching just finished the Twirls. They really really ARE bite sized, look! I was really sensible and did not eat all of the popcorn chocolate by myself. I gave the hubby half of the bag to finish last night (it was actually a third ;-) ), but he loved it as much as I do/did. Lucky you shopping for chocolate. I would have chosen the popcorn one too. 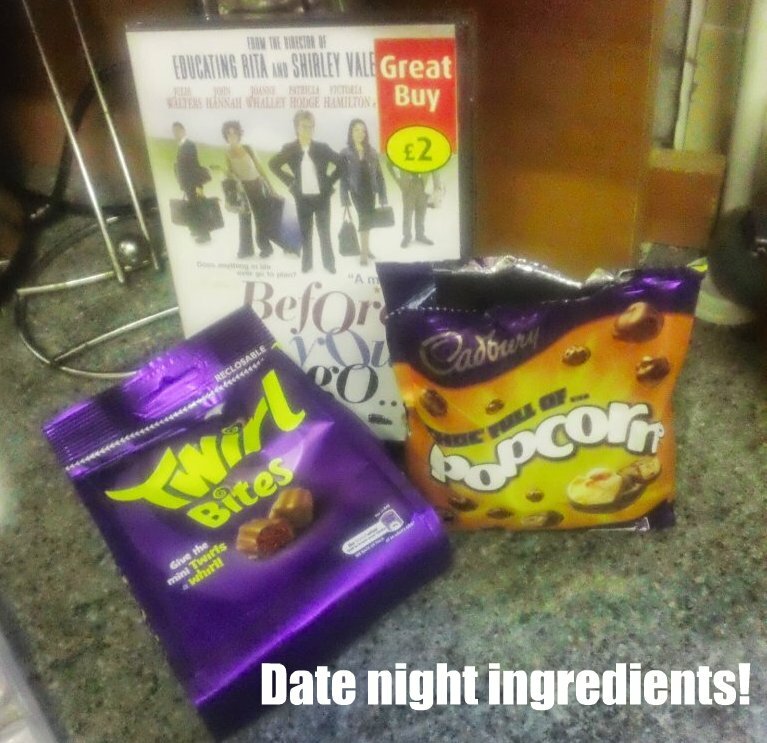 Our date nights never go quite to plan but the chocolate helps to make up for it I'm sure! Thanks for stopping by and commenting on my blog, Liska. Your date night pretty much sounds like all of ours... a big flop! I've got 3 children, all girls, and it's really hard to find some time to yourselves once the little ones come across. I know what men are like with the remote controls too, like psychotic beasts wielding a sword! We don't have date nights either, mainly because my OH falls asleep at around 9pm every night!